Jack is the son of a humble farmer and he has no real aspirations of becoming anything other than a farmer himself. The eleven year old boy has no fondness for sheep and does not really enjoy doing farm work, so when the local bard offers to take him on as an apprentice Jack is thrilled. At long last he will get to do something more than manual labor. Jack gets a lot more than he bargained for though. It turns out that the Bard not only knows how to sing, tells stories, and play the harp; he also is a pretty powerful druid. In his past the Bard managed to upset a most unpleasant half-troll who just happened to be the wife of King Ivar the Boneless, a powerful Viking leader. The Bard now lives in fear that Queen Frith will find him and harm him and everyone in his vicinity. The Bard has good reason to be afraid and so do the villagers. The first thing that happens is that the Bard gets struck down by some dreadful malady. Then the Vikings raid the coast and they carry off Jack and his sister Lucy. The Vikings, a group of Beserkers who leave chaos in their wake, are pleased when they learn that Jack is a bard, and the leader of the group, Olaf One-Brow, decides to keep Jack for himself instead of selling him. It is also decided that Lucy will be given to Queen Frith as a gift. Desperately Jack tries to find a way to gain his sister's freedom, to no avail. The pretty little blond girl is a prize and the Vikings have no intention of letting her go. The situation gets even worse when the party arrives in the Vikings' homeland. At first Queen Frith is pleased with her gift but when Jack accidentally casts a spell on her, the Queen threatens to sacrifice Lucy unless he corrects the mistake he has made. 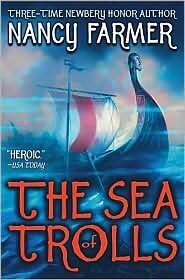 Jack has to go to the homeland of the Trolls to find the solution, and the journey promises to be a very dangerous one indeed. Readers who like long tales with plenty of magic, magical creatures, battles, and unexpected plot twists will greatly enjoy reading this title. It is interesting to see how the characters change as the story unfolds, how they make mistakes and learn from them.